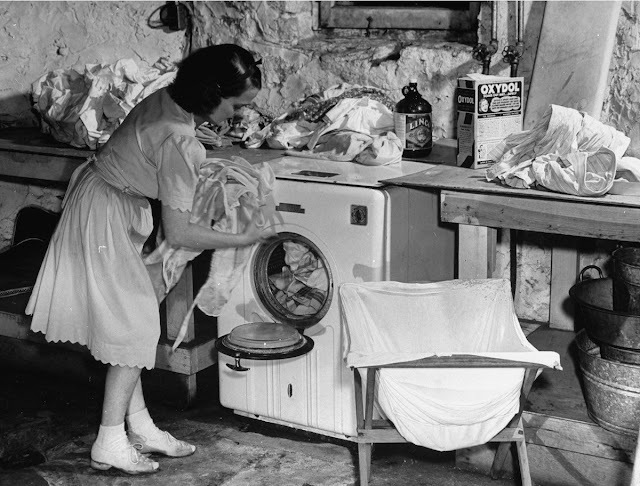 In 1941, LIFE magazine sent photographer William C. Shrout to document the lives of one of the biggest single demographics in the U.S: the 30 million housewives who did most of the washing, made beds, cooked meals and nursed almost all the babies of the nation, with little help, no wages and no other jobs. 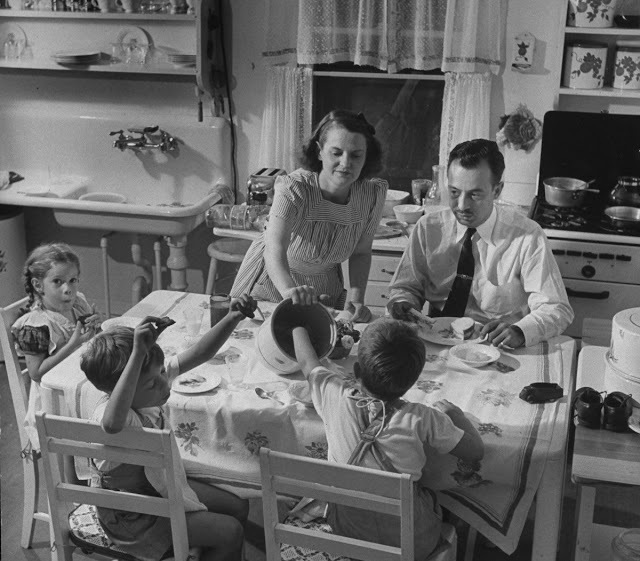 They are responsible for making a greater number of attractive homes, raising better-fed and clothed children and managing the highest standard of mass home living that the world has ever known. 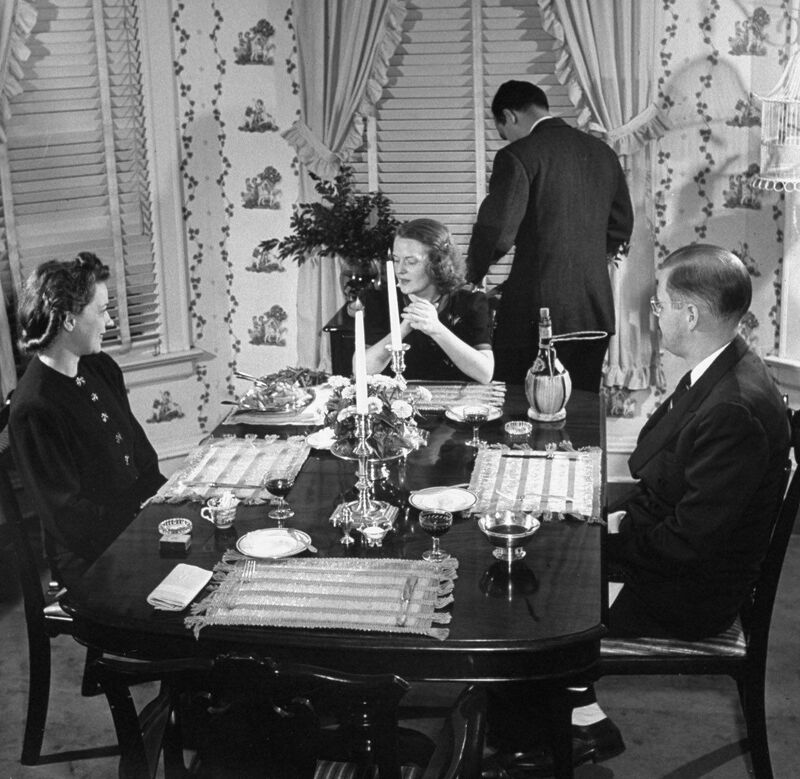 The magazine chose Jane Amberg from Kanakee, Illinois as its subject, a modern, young, middle-class housewife. 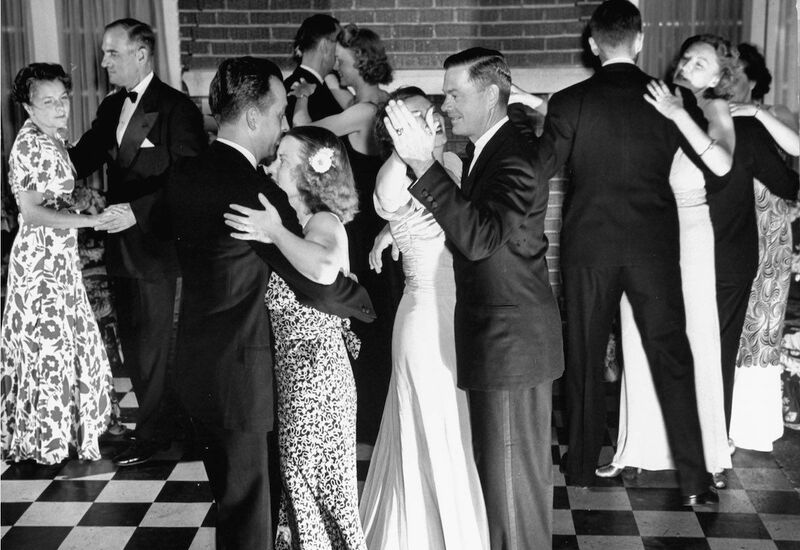 Around 1927, she went on a blind date with Gilbert Amberg. 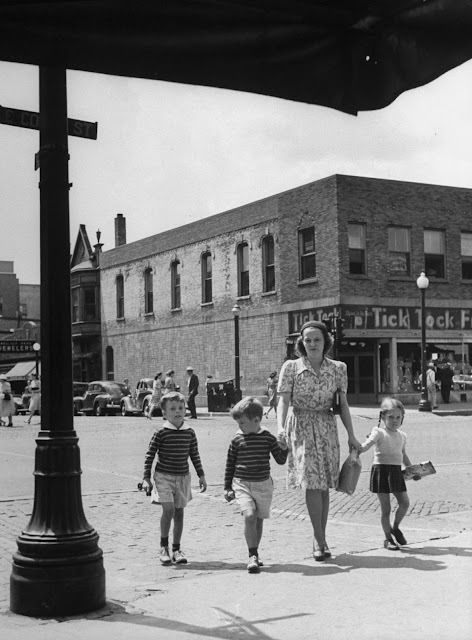 Three years later they were married, when Jane was 21. LIFE documented the jobs Jane performed to make sure their household ran smoothly. 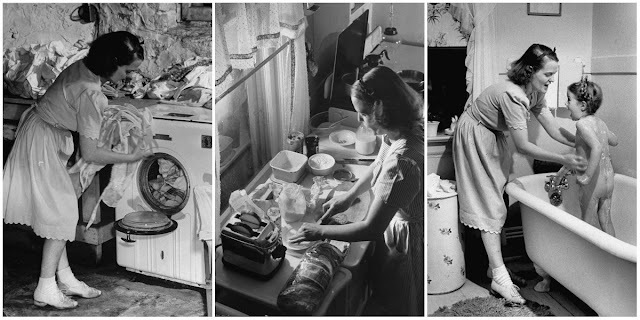 It represented the responsibilities of millions of other American women a the time: seamstress, chauffeur, laundress, chambermaid, cook, dishwasher, waitress and nurse. In Jane's case, a maid came in occasionally to vacuum the floor and wash the windows, at $0.35 per hour. Through all of this, Jane had to be her husband's "best girl" outside the home. 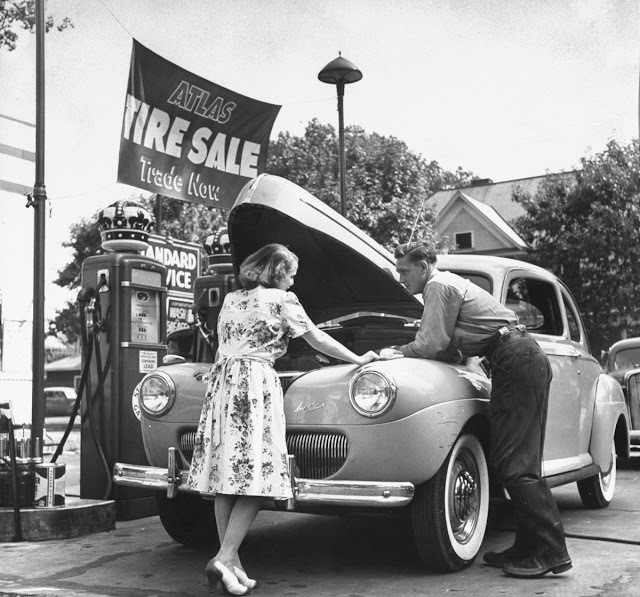 Once per week, the couple went to dinner, the movies or visited friends. They also entertained at home. 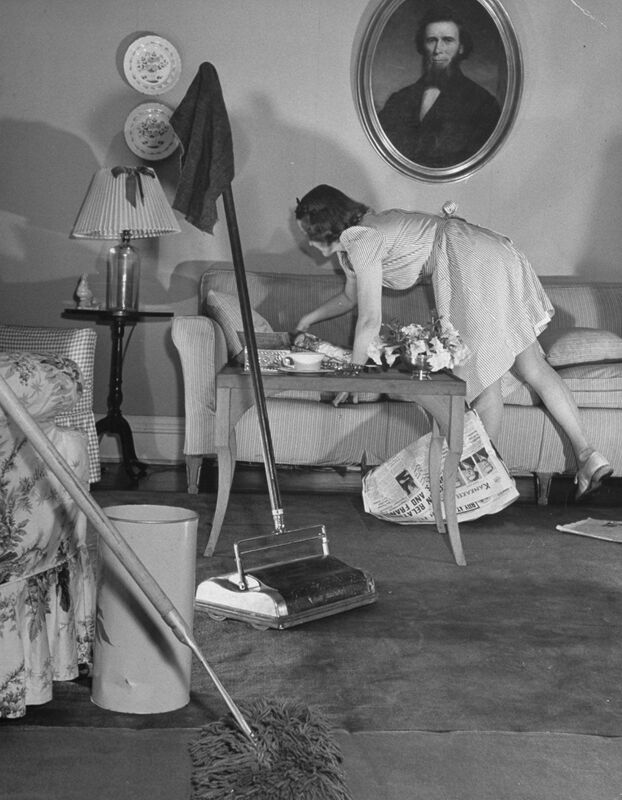 Jane busy straightening up before launching into some heavy cleaning with dust mop and carpet sweeper. Jane making one of the four beds she does daily, after doing breakfast dishes and getting the kids to school. 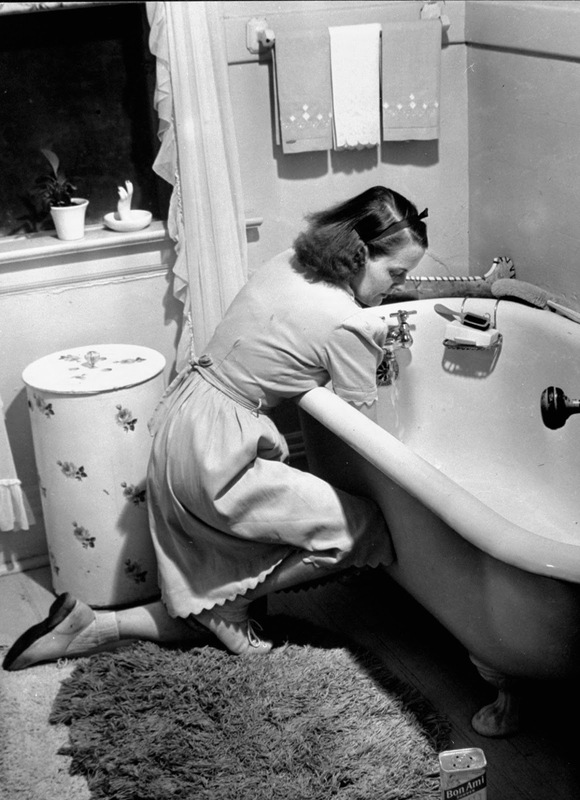 Jane scrubbing the bathtub in bathroom at home. Jane with Peter, Tony and Pamela, as they go to the drugstore to buy ice cream cones, after the boys had haircuts at local barbershop in town. 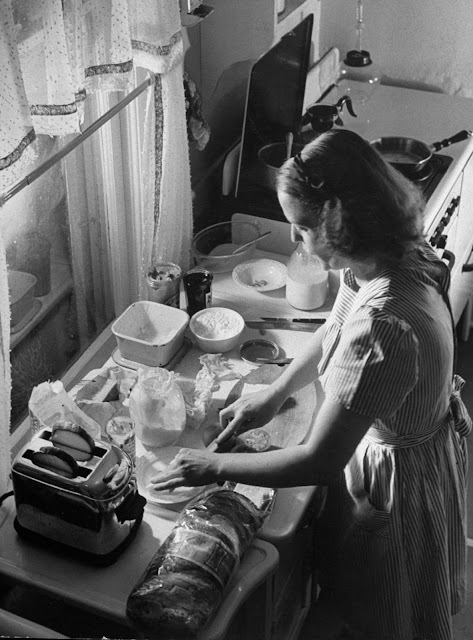 Jane using pop-up toaster, as she makes sandwiches for her three children. Jane conferring with a mechanic at gas station about the car she uses to chauffeur her husband to and from his office, plus get the children back and forth to school. 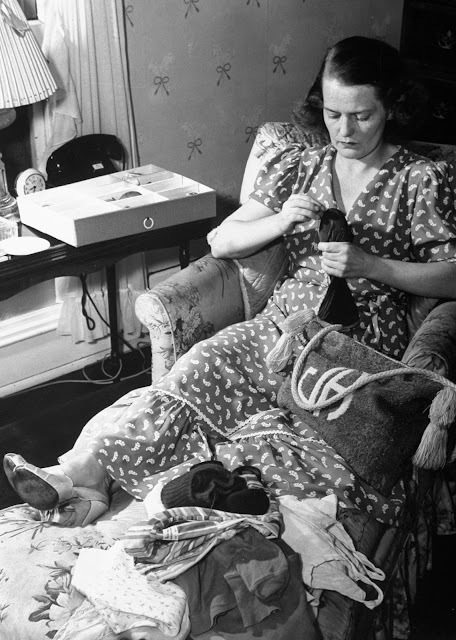 Jane mending a pair of socks as she lounges in bedroom while listening to her favorite jazz records during her leisure hours (time with out kids). Jane loading the automatic washing machine with several days' dirty clothes, in basement at home. 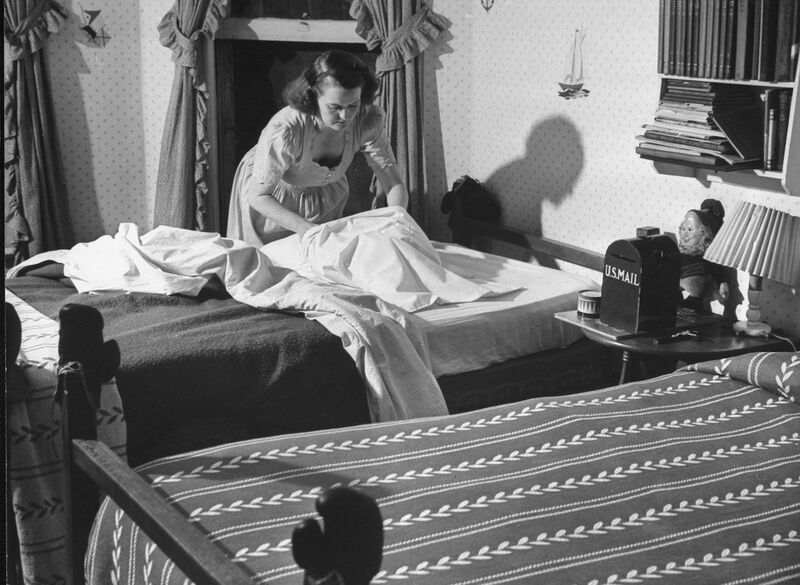 Jane bathing her daughter Pamela, 4, before dressing her for bed at night. 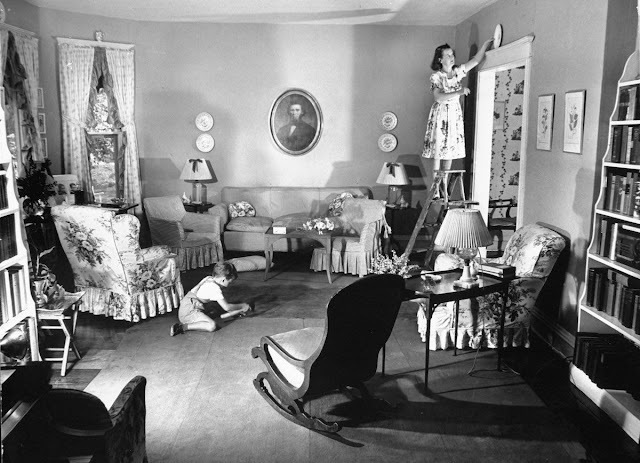 Jane standing on ladder to place special china plate as decoration above the doorway in the living room, which she decorated herself, as her son Tony plays on the floor. 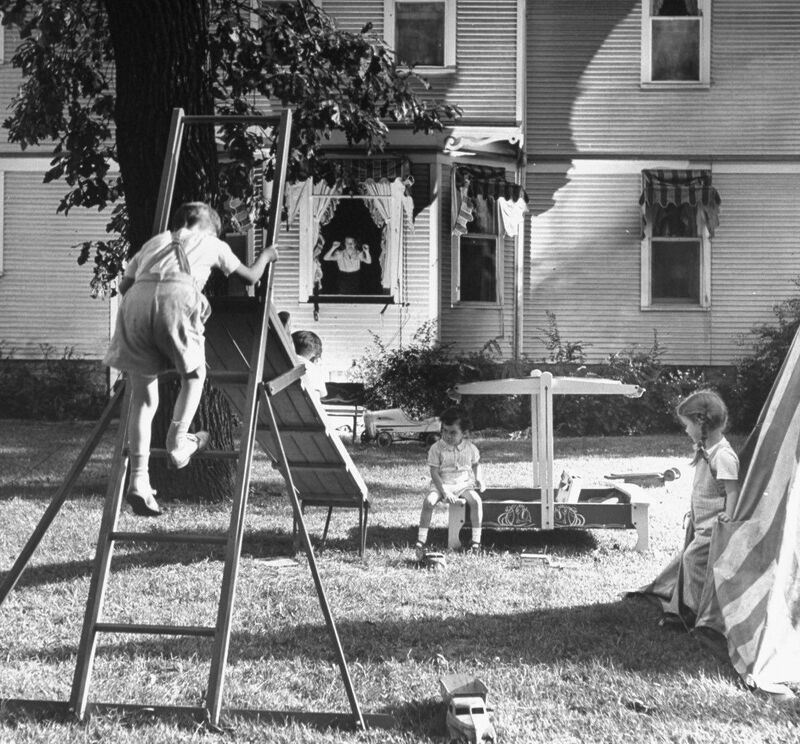 Jane rapping admonishingly on the window in the background as she oversees her kids Peter, 7, climbing the slide ladder, while Tony, 5, blocks the slide, and Pamela gets kicked out of the tent while playing with a neighbor's children. 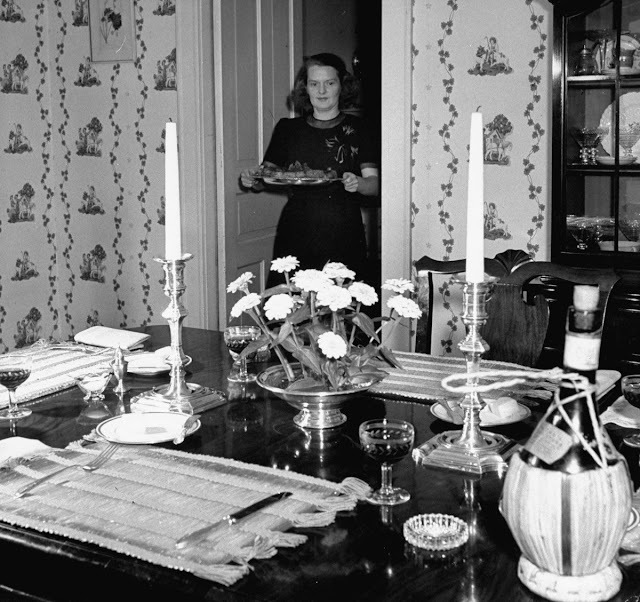 Jane prepares for dinner party by carrying a roast beef platter to the dining table she has carefully set with colorful placemats, silver candlesticks and silver centerpiece with flowers and a bottle of Chianti, as her guests finish cocktails in the living room. Jane chatting with her dinner guests Mr. Bert Miller and wife, as her husband Gilbert stands behind her, carving a roast beef to be served at the table. 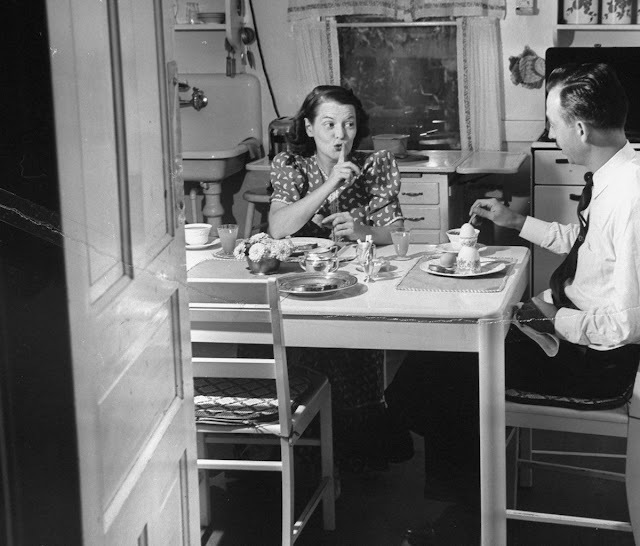 Jane shushing her husband Gilbert, as they sit having a quiet 6:30 a.m. breakfast before their three kids wake up, in the kitchen at their home. Jane serving lunch to her husband Gilbert, who has come home from the office a few minutes away, and her ever-present kids. 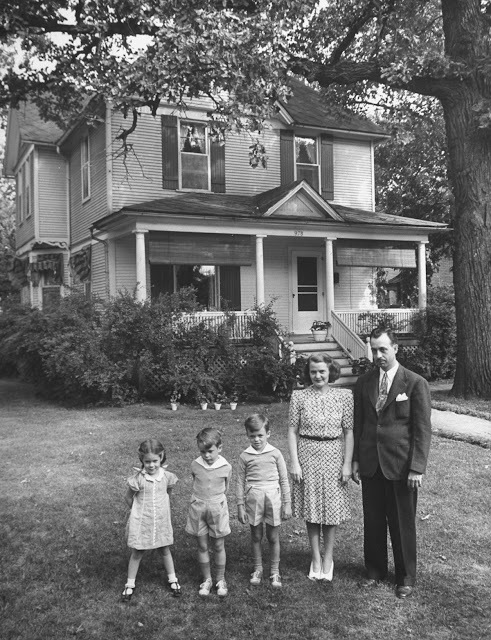 Jane posing with her husband of 11 years, Gilbert, and their three kids Pamela, 4, Tony, 5, and Peter, 7, in front of the large two-story house they lease. Jane dancing with her husband Gilbert (third from left) amidst other couples at their country club's formal dance.